Kerastase Reflection Fondant Chromatique 2.5oz/75ml TRAVEL. Condition is New. Dispatched with Royal Mail 2nd Class. Gently cleanses and selectively treats the dry areas of your hair. Leaves your hair healthy, shiny and easy to manage. Item slightly scratched & grubby from the storage. Product colour may slightly vary due to photographic lighting. Treat your coloured-hair toKérastase Reflection Bain Chromatique Shampoo, a colour-reviving formula specially developed to cleanse and revitalise colour-treated hair. This is the new updated version ofKerastase Chroma Captive. Taming frizz and protecting against humidity. What makes Scent Warehouse so good?. BRAND NEW L'OREAL KÉRASTASE BAIN ANTI-PELLICULAIRE SHAMPOO 1000ML. BRAND NEW L'OREAL KÉRASTASE BAIN VITAL DERMO-CALM SHAMPOO 1000ML. Kérastase shampoo Reflection Bain Chromatique is a colour radiance shampoo for all coloured hair. Shape in motion cleansing conditioner for unruly curly hair. Gentle cleansing- no silicone - no sulphate. Formulate specifically to treat and define the look of curls. KÃ©rastase Aura Botanica Bain Micellaire 250 ml. 250Ml item. Kerastase aura. Gentle sulfate free aromatic shampoo gently cleans fibers. This system allows for you to get the longest dated and genuine products available. KERASTASE PROFRSSIONAL HAIRCARE. NUTRITIVE RANGE. BAIN SATIN 2 SHAMPOO. Smoothing and gentle for soft hair. Intensive weekly treat for dry hair. Ideal for all skin types, including sensitive skin. Sealed and fresh. KERASTASE RESISTANCE MASQUE EXTENTIONISTE. Apply a quarter size amount of Masque Extentioniste to wet hair, working from mid-length to ends. Leave on for 5-10 minutes, then rinse. size : 200ml / 6.8fl.oz. 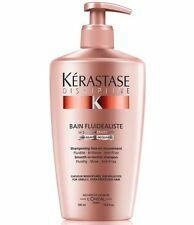 1 x unused 250ml bottle of Kerastase Discipline - Bain Fluidealiste - Smooth-In-Motion Shampoo. Maßeinheit 100 ml. A collection of goods is excluded. EAN 3474636494668. Marke Kérastase Paris. San Marino and Monaco 5,95 EUR. It contains finest highly concentrated active ingredients that deeply nourish and strengthen the hair. Shampoo your hair with Kerastase Bain Chronologiste. Add the pearls to the Chronologiste bowl and mix smoothly with cream using the spatula so that the pearls break and blend with the mask. KERASTASE Nutritive Nectar Thermique 150ml Nourishing Cream Heat Protectant NEW! KERASTASE NUTRITIVE NECTAR THERMIQUE. Nectar Thermique contains Royal Jelly extract which is rich in carbohydrates, lipids, and proteins to create softness and shine. size : 150ml / 5.1fl.oz. Leave-In Heat Protectant for Dry Hair. 4.5 out of 5 stars - KERASTASE Nutritive Nectar Thermique 150ml Nourishing Cream Heat Protectant NEW! 14 product ratings14 product ratings - KERASTASE Nutritive Nectar Thermique 150ml Nourishing Cream Heat Protectant NEW! 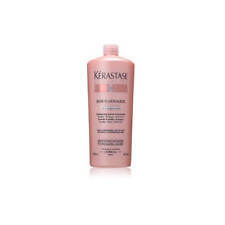 Kerastase Bain Satin 2 is a shampoo designed for dry and sensitised hair. Easy detangling and hair is smooth from roots to ends. Spread a small amount onto your hands and apply to wet hair. Work into a lather, rinse and repeat. Then finish with a Kerastase conditioner or masque. Kerastase Masquargil Mask will leave the hair and scalp pleasantly clean and refreshed with softness and natural radiance. KERASTASE SPECIFIQUE MASQUARGIL. Using a spatula, apply the contents on the scalp - try to spread the product evenly and massage. Kerastase Aura Botanica Micellaire Shampoo 250ml Women. KERASTASE SOLEIL BAIN APRES-SOLEIL. Kerastase Bain Apres-Soleil shampoo is specifically designed to protect color treated hair from UV rays, making it more resistant to sun exposition. This shampoo can help to remove styling products, sand and salt and yet provide extended softness, flexibility and shine. KERASTASE Resistance Bain Extentioniste Shampoo 250ml, For Long Hair NEW! This fortifying shampoo consist of powerful amino acids and ceramides to strengthen the internal structure of the hair and improve elasticity from root to tip.Kerastase Bain Extentioniste's silky formula gently removes build-up, impurities and excess oil from the scalp to leaving the hair well protected, fresh, strong with visibly healthy look and natural shine. 5 out of 5 stars - KERASTASE Resistance Bain Extentioniste Shampoo 250ml, For Long Hair NEW! 3 product ratings3 product ratings - KERASTASE Resistance Bain Extentioniste Shampoo 250ml, For Long Hair NEW! 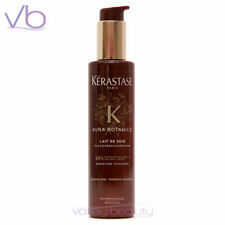 Kerastase Aura Botanica Eau De Vagues is a leave-in texturizing mist designed to create healthy glowing beach waves. This zero-crunch formula spray is great alternative for sea-salt products to create après-surf appearance. Hair Type All Hair Types. Directions for Use Gender Unisex. 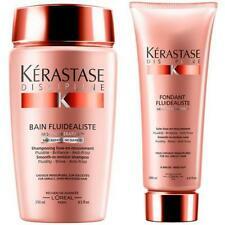 KERASTASE SPECIFIQUE BAIN ANTI-PELLICULAIRE. Kerastase Bain Anti-Pelliculaire is a silicone-free formula that gently removes impurities and treats the scalp preventing the recurrence of dry or oily dandruff. This refreshing shampoo has a thickening effect and hair looks denser with regular use. The scalp feels clean and light and the hair fibers look and feel thicker and denser. Daily Care Shampoo. Apply a quarter-sized amount to wet hair and scalp. 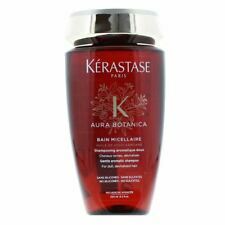 Kérastase Aura Botanica Bain Micellaire is a gentle aromatic shampoo for dull, devitalized hair. This micellar shampoo promises gentle-yet-thorough cleansing action. We are very serious against false claims. It works to rebuild your hair’s internal strength and leaves it full of body, vitality and shine whilst feeling incredibly soft. size : 200ml / 6.8fl.oz. Protecting mid lengths and ends. KERASTASE NUTRITIVE MASQUE OLEO RELAX. Apply 1-2 teaspoons to clean, towel-dried hair. Massage from roots to ends, then comb through. Leave in for 5 minutes. Emulsify with warm water and rinse thoroughly. It's 99% natural origin formula is enriched with Natural Beeswax, Thai Rice Bran Oil, Argan Oil and Amazonian Brazil Nut Oil which is rich in fatty acids and vitamins to leave the hair and skin feeling soft and fully replenished. Like a auntentico were reborn, hair and scalp are revitalized. Regeneration CREAM 500ML 15 X 8ML. Sublimate / With Rinse / Available in 500ML and 15X8ML. - Vitamin A: It acts on the regeneration of the hair fiber. Lait De Soie's light-as-air milky formula is enriched with Moroccan Argan Oil and Samoan Coconut Oil to softens each strand and combat frizz. KERASTASE AURA BOTANICA LAIT DE SOIE. size : 150ml / 5.15fl.oz. Zinc gluconate preserves color by strengthening ionic bonds between coloring agents, while linseed oil polishes hair fibers to maximize light reflection. We are very serious against false claims. Any attempts with intend to manipulate our system will result in appropriate repercussions. Size : 250ml / 8.5fl.oz. Envelopes the hair fibre during cleansing. This nourishing formula will leave your hair soft, supple, light and shiny from root to tip and curls will be left defined and disciplined. Fights humidity and frizz. Place the product into your hands, rub hands together and work into your hair section by section. Size : 150ml / 5.15fl.oz. Protects from frizz for 96h in 90% humidity. Curl Definition, Healthy Glow and Texture. Silicone free, paraben free. Contours and defines curls without stiffness.